I'm currently reading Here Lies Arthur by Philip Reeve, which is a retelling of King Arthur from the point of view of a servant-girl of Merlin's. I'm only about 100 pages into it, but as I was reading it, I was thinking that the legend of King Arthur is everywhere. In books and film and other media and everybody knows something about it because it's so fascinating, with all the different aspects of it from the romance, the magic, the honour and bravery of the knights. I've also been watching the new BBC miniseries, Merlin and the two combined make me feel a little excited - like I'd like to read other books and maybe other people would like to join me? Maybe that's too ambitious, but I think I'll definately explore this list of books about King Arthur and see where that takes me. 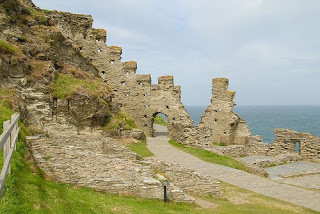 Who knows, it might even be an excuse to visit Tintagel Castle, the castle connected with the Arthurian legend which is Cornwall! I always like to read books about Arthur and Merlin. I read Philip Reeve's book earlier this year and thought it was very good. I'm also watching and enjoying the BBC's Merlin, which gives a completely new look to the legend - at least to me it does. It's been years since I visited Tintagel, but I remember it being very atmospheric - I hope it hasn't been commercialised since then. After Merlin I'm getting excited about some Arthurian reading to. Looking at that Wikipedia list I can thoroughly recommend the Dark is Rising Sequence, it's my favourite children's series and got me very very into Arthurian legend when I was younger. Another Arthur book I'm getting excited about (and I'll be honest here, I'm a stallholder for the particular publisher in question, although I won't link to my book selling website here) is Arthur of Albion by John Matthews and illustrated by Pavel Tatarnikov. I haven't got it yet but it looks beautifully illustrated and apparently has the best known stories about King Arthur and his court combined with research on who Arthur really was and where Camelot really was. I'll be reviewing it on my blog (and I normally try and keep my Lacer blog book selling free) when I get my hands on a copy. As for Tintagel, I've been there and it's stunningly beautiful. I'd recommend it. I can certainly second Lacer's recommendation of 'The Dark is Rising'. It starts to wander towards the end of the last book, but by that time the writer was ill and I think it shows. Philip Reeve is one of the great writers for children at the moment and 'Here Lies Arthur' was a worthy winner of this year's Carnegie. I hope you continue to enjoy it. Ann - that's interesting, I never knew she was ill at the end of the last book, I agree it does wander a bit and it isn't my most favourite part of the series. That sounds like an interesting book. I think the story of King Arthur is fascinating, thats why you can find it in so many books and films. One of my favorite films is 'Camelot'. Hmm. I'll try to persuade my husband to take a trip out to Cornwall sometime soon. And also, I'll look out for The Dark is Rising. I've heard good things about it, but hadn't realised it was about King Arthur. We are studying the life and times of Arthur in our home studies right now. I also went to wikipedia for info. How incredibly is it that you can actually go see Tintagel Castle! I think it is incredible! There's so much history here, fascinating! Hi there, I noticed you were following my blog, thank you for becoming a follower, I appreciate that. I thought I would stop by and say hello. There is a hill called Arthur's seat in the city where I live (Edinburgh). Allegedly, King Arthur gathered there with his knights. I am enjoying Merlin too, it's very transfixing for my boys too.